Glaucoma is an eye disease caused by damage to the optic nerve occurring from eye pressure (not blood pressure). This disease can result in permanent vision loss if left untreated. Glaucoma is the second leading cause of blindness worldwide and millions of people in the world lose their vision from it every year. Unfortunately, there is no current cure for glaucoma, but it can be controlled with routine and regular eye care. There are more than 30 different types of glaucoma, and individuals of certain ethnic background are more prone to specific types of glaucoma than others. Most classifications of glaucoma are based on the area of the eye called the “angle.” The angle is where the internal drainage system of the eye is located. This is in contrast to the external drainage system where tears form and come from. Primary Open Angle Glaucoma: This type of glaucoma is more common in African-Americans and Hispanics. It is characterized by open access to the eye’s internal drainage system (the angle), but the drainage system does not work well. Most of the time, this type of disease can cause vision loss without the patient feeling any changes. 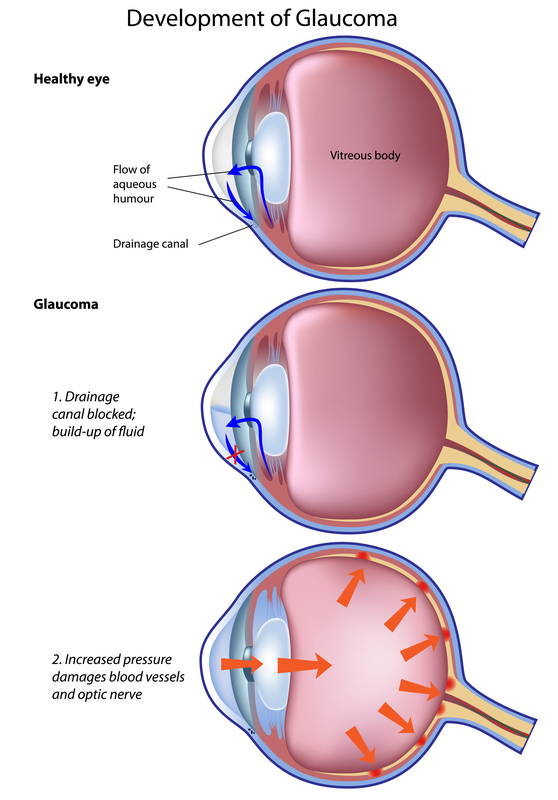 Acute Angle Closure Glaucoma: This type of glaucoma is caused by a sudden rise in eye pressure from a blockage of the eye’s internal drainage system called the “angle.” This sudden high eye pressure usually causes eye pain, redness, blurred vision, and sometimes nausea and vomiting. If the eye pressure is not lowered quickly, it can cause permanent vision loss. Certain medications can increase the risk of developing this condition. A complete eye exam can identify if you are at risk for angle closure glaucoma, and a laser procedure can be performed to prevent vision loss from this type of glaucoma. Chronic Angle Closure Glaucoma: This type of glaucoma is more commonly found in persons with Asian heritage. It is characterized by a slow progressive blockage of the eye’s internal drainage system. Pseudoexfoliation Glaucoma: This is a type of glaucoma in which a protein is deposited throughout the eye. This protein can affect the internal drainage system and create high eye pressures. It also deposits on the lens of the eye and its support structure. This can make surgery more challenging. Pigmentary Glaucoma: This type of glaucoma is characterized by pigment being released from the colored part of the eye – the iris. It is more common in nearsighted men in their 20-30’s. This pigment can settle in and block the drainage system causing high eye pressures. Neovascular Glaucoma: This type of glaucoma has abnormal blood vessels growing over the eye’s internal drainage system and causing glaucoma. There are multiple causes for these blood vessels to start growing including poorly controlled diabetes and hypertension. There is no single test to diagnose glaucoma. It requires a comprehensive eye examination incorporating a variety of tests to determine if you are at risk for glaucoma. Repeated eye examinations are required to check for the development of glaucoma, especially if there are other risk factors involved. The most important risk factor for glaucoma is ocular hypertension (increased pressure within the eye). However, people diagnosed with glaucoma do not always demonstrate elevated ocular pressure at the time of their presentation.